Instant noodles are high in sodium and low in nutrition, but they will always have a special place in my belly. It is one of my favorite comfort foods that I occasionally eat late at night when I want something quick, hearty and not necessarily healthy. 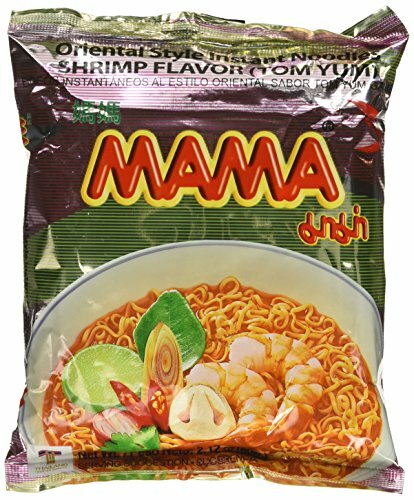 There are many varieties and many brands of instant noodles to choose from, but my all-time favorite is Mama Shrimp Flavor (Tom Yum) Oriental Style Instant Noodles. I eat this brand exclusively. 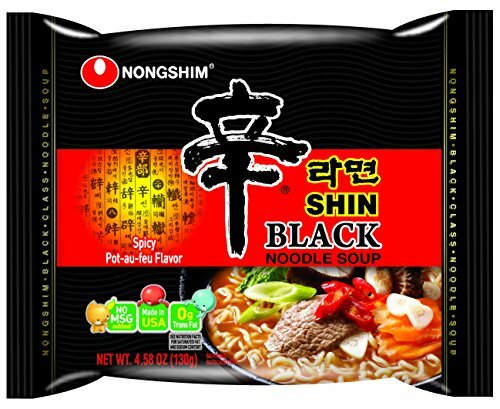 No other brand can come between me and my Mama instant noodles, not even the widely popular and husband's favorite, Nongshim Shin Ramyun instant noodles. Both ramens are always well stocked in the pantry, enough to sustain us in a zombie apocalypse. As a kid, I ate instant noodles dry, straight from the bag. An after school snack was a bag of Mama instant noodles, crushed into small pieces and sprinkled with the accompanying seasoning packet. It was a poor man's snack, but it was one of my favorite childhood memories. Kids these day will never know the awesomeness of dry instant noodles straight from the bag. My instant noodles have gotten a lot more sophisticated over the years. I pimp my instant noodles with lots of veggies, proteins and always an egg. Boom. Instant noodles are now full-blown semi-healthy meals. Best of all, they are quick to make. Proteins are usually leftovers and vegetables are whatever I have in my fridge or freezer at the time. I love trying the real ramen in ramen shops but there are times when I just rather have my favorite instant noodles with some simple additions. Below are my three favorite combinations of toppings that can turn boring instant noodles into ghetto-fabulous meals. Mi Trieu Chau is egg noodles in a clear and flavorful pork broth. You can choose from a variety of toppings: blanched Choy Sum (similar to the well-known Bok Choy but with a longer stalk), wontons, squid, shrimp, ground pork, and thinly sliced pork organs like kidney, heart and liver. It’s garnished with a few bits of crispy pork fat (nom nom nom) and a sprinkle of chopped cilantro and green onions. Pho Ga (Vietnamese Chicken Noodle Soup) is the quick poultry alternative to its more well-known and beloved cousin, Pho Bo (Vietnamese Beef Noodle Soup). Pho consists of rice noodles in a hearty and aromatic broth made from either beef or chicken stock, topped with meat and garnished with fresh herbs. My husband loves ramen so when we get a chance to go to San Francisco, we head to the Westfield mall food court and have lunch at Ajisen Ramen. Their spicy miso ramen is one of my favorites. Whenever I have their ramen, I try really hard to perfect the ramen and broth ratio for each bite so that no liquid-gold-miso-broth would ever be left behind. Unfortunately, San Francisco is quite a ways out. If we don't head to San Francisco, we get no ramen and that doesn't sit well with me. I figured it was about time to make my own ramen. Vietnamese Thick Noodle Soup, or Banh Canh, is one of my favorite childhood foods. It's the most simplest and purest of all the Vietnamese noodle soups. As a kid, I ate it regularly for breakfast, lunch and dinner. In its simplest form, it's thick noodles in a rich and savory pork broth. There aren't too many components like other Vietnamese noodle soups. However, variations of Banh Canh such as Banh Canh Cua can include proteins like crab, shrimp, fish balls, and fried fish cakes. In restaurants, a side of Vietnamese herbs and greens also accompanies the noodle. My mother-in-law would spend the entire day putting Mì Hoành Thánh together. Not only does she make the broth completely from scratch with chicken and pork bones, she also assembles each individual wonton, makes Chinese/Vietnamese Barbecue Pork, preps all the vegetables and makes the fried shallots herself when she can easily get them at the grocery store. And all that pork fat from meat trimmings that she stockpiled in her deep-freezer for, what one would assume, zombie apocalypse? She finally takes them out and fries them into crispy pork fat (Tép Mỡ) as a crunchy topping to dress the noodle soup. Udon is thick Japanese noodles made from wheat flour. It's great in both soups and stir-frys. I would occasionally swap out my regular Banh Canh noodles, made from mostly tapioca flour, with Udon noodles because it's heartier with better texture. Udon in stir-fry is also great because the thick udon noodles absorb stir fry sauce nicely. Vietnamese Pork & Seafood Noodle Soup or, Hủ Tiếu, is to South Vietnam as Phở is to North Vietnam, and Bún bò Huế is to Central Vietnam. Hủ Tiếu consists of mostly pork and seafood, and it's a lot more versatile than the other noodle dishes. Instant noodles are high in sodium and low in nutrition, but they will always have a special place in my belly. My instant noodles have gotten a lot more sophisticated over the years. I pimp my instant noodles with lots of veggies, proteins and always an egg. Boom. Instant noodles are now full-blown semi-healthy meals. Best of all, they are quick to make. Bún Riêu is a Vietnamese rice noodle soup with a tomato and crab soup base. It is eaten with a lot of fresh veggies and Vietnamese herbs, the popular of which is split water spinach stems (Rau Muống). The other day my family and I tried a relatively new restaurant in Oakland Chinatown that specializes in Da Nang cuisine. Of course, Mi Quang was one of their signature items and it had raving reviews on Yelp. However, when I tried it, I found the broth underwhelming. I told my mother-in-low, Cooking Extraordinaire, about my experience and of course, she set out to prove that the best Mi Quang comes from home. She didn't disappoint. My favorite Vietnamese dish of all time is Hanoi-Style Rice Vermicelli with Grilled Pork, also known as Bun Cha Hanoi in Vietnam. It's a dish that I can never get enough of. It's a refreshing and light dish, made up of rice noodles (bun), pork patties (cha), and thinly sliced fatty pork shoulder. Some awesome restaurants even add in grilled shrimp in the mix. The noodles and pork are eaten with fresh Vietnamese herbs and a sweet chili sauce. When we think of Vietnamese food, people usually think of Pho, a very popular Vietnamese Noodle Soup dish made from either beef or chicken stock. But have you heard of its fiery cousin, Bun Bo Hue? Bun Bo Hue isn't quite as popular as Pho but I think it's slowly getting into the spotlight as one of the tastiest Vietnamese noodle soup dishes. Bun Thit Nuong Cha Gio is a light and refreshing Southern Vietnamese entree that consists of rice noodles, grilled pork and egg rolls, topped with a mixed of Vietnamese greens, crushed peanuts and the iconic Vietnamese fish sauce dipping sauce.